Somewhere in America, in a generic suburban town with the same ‘creeps and weirdos’ that frequent every American neighbourhood, pale-faced, black-haired Enid (Thora Birch) and her partner in crime Rebecca (Scarlett Johansson) have just graduated high school and are reluctantly trying to figure out exactly what they’re going to do next. They want to be independent, but the prospect of getting a job and becoming like all the other “stupid” or “depressing” people in the town seems to be a highly unappealing course of action. 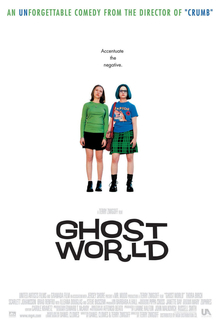 Produced by John Malkovich, based on Dan Clowes’ underground comic book, and directed by Terry Zwigoff, Ghost World is a comedy-drama reflecting the challenges of two teen girls as they try to come to terms with the expectations of becoming adults. In particular, the film follows young Enid who seems simultaneously caught in a barren modern ghost world and in her own private ghost world where she yearns for the sparkle and brilliance of 50s and 60s America. Together, Enid and Rebecca, the two young misfits, stand uncertainly at a major fork in the road, with no real sense of where they need to go. And so begins their journey. Indeed, the first half of the film is bitingly funny as the girls pass the summer bluntly and unapologetically looking down on everyone and everything in their dull and odd little town. For all intents and purposes, it seems we’ll be taken for a ride with two post-high school teens as they try awkwardly to find their places in the world, and have a few laughs while they’re at it. But about halfway through, we realise that neither Enid nor the film is going to indulge our expectations, and what we’re getting is some strange cross between American Pie and American Beauty, though with a personality and vision uniquely its own. Despite continued humour generated through Enid’s summer school art class, where Illeana Douglas gives a hilarious performance as a slightly neurotic artsy-fartsy teacher/artist/political activist, the film undergoes an unanticipated mood swing midway. While Rebecca seems to come to terms with the responsibilities of adulthood by finding a job and an apartment of her own, Enid continues to flounder, resisting the encroachment of modern America’s homogenous commerciality, dominated by Nike and McDonald’s, on her funkier-than-thou existence. She attempts to follow Rebecca’s lead by finding a job in a movie theatre, but finds herself warning patrons against the bad movie and the toxic sludge that is the butter on the theatre’s popcorn, earning her a prompt dismissal by the end of her first day. The two girls find themselves growing apart, and their distance is pivotal to the film’s major change of direction. Enid finds herself more and more attracted to the older, spastic, 78-collecting, lonely Seymour (exquisitely portrayed by Steve Buscemi, who is brilliant at playing the socially inept) -, on whom the two had initially played a practical joke. This new bond between Enid and Seymour is something Rebecca cannot understand or accept. So as Rebecca becomes more and more “normal”, taking on all the trappings of any other 18-year-old girl, Enid finds herself crumbling under the changes that are happening around her. Her father has rekindled a serious relationship with an old flame; she and Rebecca have become estranged; and Seymour has a girlfriend who prefers that he not have Enid as a fixture in his life. All that’s left for Enid is her ‘number one fantasy’ of one day just taking off without telling anyone where she’s going, and simply disappearing. It seems the only plausible development of the story is that Enid will finally resolve her conflicts with the ghost world around her and with her strained relationships, or give up her obsession for her other ghost world of groovy 78s, 50s Bollywood dance movies and what she sees as a richer time long gone. We think she has to come to terms with the not-so-authentic local 50s diner, and as she has done all along, find a way to satirise it and move on. But instead, everything becomes far more conflicted, far more poignant, and we realise that the expected resolution is not forthcoming. Frustrated and alone, Enid decides that the only person who is a constant in her life, Norman (a man who sits day in day out waiting for a bus on a line which has been discontinued), is the only one she can count on, and in the film’s moving and unusual ending, we see that perhaps she is right. Ghost World has much to recommend it. It boasts flawless performances from its cast (which also includes Brad Renfro as Rebecca and Enid’s common love interest; Teri Garr as Enid’s potential stepmother and Bob Balaban as Enid’s father); stylish cinematography from Affonso Beato (which perhaps is spoilt only by occasional abrupt cuts in the film); and artful costume choices by designer Mary Zophres. It is a treat to note the constancy of Enid’s bold and unadulterated blacks, reds and blues against the dull earth tones of Seymour’s attire and the muted pastels that begin to predominate Rebecca’s wardrobe as the story wears on. Thora Birch is particularly good at bringing her comic book character to life, wonderfully combining the stock cartoonish nature of the original character with the nuance and complexity of a fully fleshed out human one. Indeed, all of the characters manage to be quirky and memorable without becoming caricatures or uni-dimensional, so much credit must be given to the cast and to Clowes and Zwigoff (who also co-scripted the film) for carefully avoiding that. Ultimately, the film is highly entertaining and engaging, but don’t go in expecting your predictable run-of-the mill teen romp. Ghost World is perceptive, funny, provocative and poignant. It’s a must-see for those who delight in the eccentric and offbeat, or have ever had difficulty with just fitting in. Especially given the puzzling ending, all you can really be sure about with this film is that you’ll probably want to source some old Bollywood 78s – or at least buy the film’s weird but infectious soundtrack. And for Steve Buscemi fans, don’t leave before the end of the credits where there’s a special treat in store!